The faculty of Tourism and Hotel Management held a seminar on “Scouting” under the supervision of the Student Activities Department. The seminar was delivered by the Scouting and Public Service team of the Student Union of the faculty of Tourism and Hotel Management. 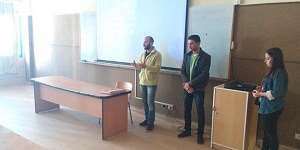 During the seminar, Mr. Abdel Hamid Abdel Azim, one of the Student Activities Coordinators at Pharos University, announced that a scouting team is going to be formed soon for Pharos University. The seminar was held on Tuesday 27/2/2018 at D112 room at the Social Studies and Humanities Building. The seminar was attended by faculty members, teaching assistants and a large number of the faculty students.